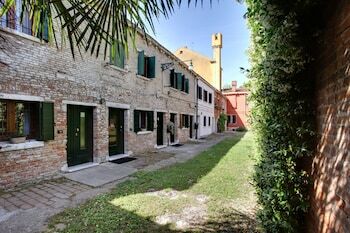 A stay at Garden Houses Apartment places you in the heart of Venice, within a 15-minute walk of Ca' Rezzonico and St. Mary of the Friars. When you a stay at Locanda Antico Borgo in Civitella in Val di Chiana, you'll be in the historical district, just steps from Praetorian Palace and Memorial of the Massacre. With a stay at Podere La Corte in Castelnuovo Berardenga, you'll be within a 10-minute drive of Az. Agr.Losi Querciavalle and Chianti Sculpture Park. Free self parking is available onsite. With a stay at Villa Margherita Tre in Cortona, you'll be 7.8 mi (12.6 km) from Santa Margherita Basilica and 8 mi (12.9 km) from Medicea Fortress of Girifalco. Free self parking is available onsite. With a stay at B&B Al Castello in Casale Litta, you'll be within a 10-minute drive of Lake Comabbio and Lake Varese. Free self parking is available onsite. With a stay at Hotel Dora in Carrara, you'll be within a 5-minute walk of Palazzo delle Logge and Piazza Alberica. The front desk is staffed during limited hours. When you stay at Hotel Palladio in Cervia, you'll be near the beach and 7 minutes by car from Piazza Garibaldi. The front desk is staffed during limited hours.